Yes...I keep saying that I've finished making all of my Christmas cards. Well - I can't seem to stop. What can I say...I love creating Christmas cards! I don't know how I'll "change gears" once the holidays are over...lol :o) *** Edit *** This card won titles in all 3 of these challenges...very exciting for me!!!!! 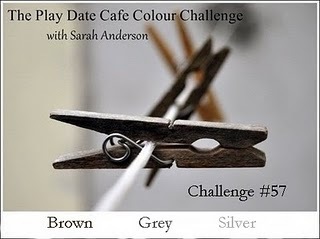 I saw the color challenge over at the Play Date Cafe, and knew that I just had to play along. Take a look at the inspiration photo that Sarah posted for us. I love it! 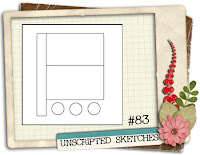 Then, I saw this fun sketch on the Unscripted Sketches blog...and decided I would combine both challenges into one card. Take a look at the sketch, below. I was so intrigued by the colors combination of brown, gray and silver. But...oh my...I struggled for a while. My first idea just would not work. I finally realized that I just needed to let go of it, and head in a completely different direction. Ah-ha! That worked...lol ! Anyway ~ on to the card. I really wanted my focus to be on the color silver. I ran some brushed silver card stock though an embossing folder (I love the texture!). I also used sterling silver embossing powder for my sentiment, and on the brown card stock that I used in the 3 brads (these were made using the pewter build-a-brad kit from SU). Oh, I also used a piece of silver cord for my bow. I am SO pleased with this card! Once I let go...and let my stamping mojo take a different direction, it was so much more fun! I'm including several photos. I had some difficulty getting the silver color of the sentiment to show. I've also included a couple of closeup pics of some of the details. Thanks for stopping in to take a look. I hope you'll leave a comment. I love reading them! This is stunning! Gorgeous use of these colours and a fabulous Christmas card! I love making Christmas cards too! Wowie, what you did with those colors and the Unscripted sketch! Amazing! This is gorgeous! You rocked those challenges, well done! So glad you joined US for this weeks challenge! Your card is just gorgeous! Wonderful job of explaining how to create this! 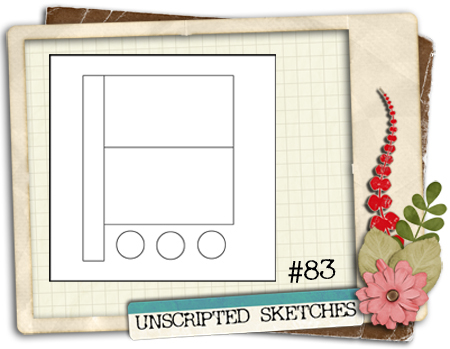 Thanks for playing at Unscripted Sketches this week! This is beautiful! Wonderful design and super use of our colors! The whole card is just fantastic! Thanks for playing along with us at the Play Date Cafe! Stunning card!! I love the embossing and the brads... amazing! Wonderful use of this week's colors over at The Play Date Cafe! SO glad you played along! Such a gorgeous card, so very pretty! Sorry, I'm a bit late in getting around to comment on everyone's blogs, but thanks for playing along with us last week at the PDCC! This is a beautiful creation Susie! Thanks for joining us at the Paper Players again. Wow! Absolutely stunning! I love the texture! Thanks for playing with The Paper Players! Love this card.so stunning. How did you make the brads? I used Stampin Up's Build-A-Brad kit to make the brads. I heat embossed with silver ep on some brown card stock, punched out the part I wanted. Then glued it to the brad base. Then attached the self-adhesive clear top. Very easy.